Thomas Jefferson Davis Bridges was born on December 28, 1906, in Gordonsville, Tennessee, 50 miles east of Nashville. Tommy’s father and grandfather were doctors, but after pursuing a bachelor’s degree at the University of Tennessee for two years, Tommy enrolled in the business school. In those days, major leaguers who attended college for a few years were almost invariably described in later press reports as “graduates” of that college, and this was true of Bridges. But while he did spend four years in Knoxville, starring for the Volunteers on the diamond, he left for professional ball before earning his degree. In 1929 Tigers scout Billy Doyle signed Bridges to his first pro contract. Pitching that summer for Wheeling in the Class C Middle Atlantic League, Bridges went 10-3 with a 3.14 ERA. In 1930 Bridges moved up to Evansville in the Class B Illinois-Indiana-Iowa League. When the Three-I League finished its schedule, Bridges ranked just 28th in the league with 140 innings … but first in the league with 189 strikeouts. He was 23 by then, and playing a different game than everybody else. Well before Evansville ended its season, the Tigers had summoned Bridges to the majors. “I’ll be ready,” Bridges said. It all sounds a bit fanciful. But the record does show that in the sixth inning, with the Tigers trailing the Yankees 10-6, Bridges did face those three future Hall of Famers in order. He got Ruth on a pop fly, gave up a single to Lazzeri, struck out Gehrig, and retired Harry Rice to end the inning. History is rarely so tidy. Bridges’ control did improve in 1933, but he also continued to walk his share of batters. And it was back in ’32 that Bridges had pitched the greatest game of his major-league career. On August 5, pitching against the Washington Senators in Detroit, Bridges sailed through the first eight innings. On the advice of Harris, he relied mainly on his fastball and set down the first 24 Washington hitters in order. Meanwhile, the Tigers were building a huge lead, the score 13-0 after eight innings. In the ninth inning, Bridges retired the first two Senators. Due next was Bob Burke, a pitcher. Would manager Walter Johnson send up a pinch-hitter for Burke? He did: Dave Harris, a good fastball hitter. Would Bridges continue to rely on his fastball? He did, and Harris lined Bridges’ first pitch over shortstop Billy Rogell’s head for a clean single. Bridges got the next guy, but the perfect game was gone. Billy Jurges came up next. Bridges threw three curveballs. Jurges swung three times and missed three times. One down. Cubs pitcher Larry French came up next—and yes, manager Charlie Grimm probably should have considered a pinch-hitter, but baseball was different then—and French swung at three straight curveballs, the last resulting in a weak grounder back to Bridges. Two down, and Hack was still standing on third base. whenever they get out there fogging hooks and fast ones through. Just a year earlier the Tigers had lost the World Series. Bridges had pitched well in that one, too. He’d been knocked out early in Game Three, but came back in Game Five and pitched a complete game to beat the Cardinals, 3-1. He also pitched an inning in the Tigers’ Game Seven blowout loss. Bridges’ decisive Game Six performance merely solidified the reputation of his tremendous curveball, which was generally rated the best in the league, and perhaps the best anyone had seen since Three Finger Brown was pitching for the Cubs back in the Deadball Era. How Bridges threw his spitball might have been a mystery, but that he threw it wasn’t much of a secret around the American League. Paul Richards told a story about catching Bridges one day against the Senators. Richards put down his signal for a curve. Bridges shook him off.Richards put down his signal for a fastball. Bridges shook him off. Richards put down his signal for a changeup. Bridges shook him off. Richards was right, and Bridges struck out Stan Spence with three straight wet ones. Spence flung his bat to the ground, protesting to umpire Bill Summers. Senators manager Ossie Bluege came out and joined the fray. After a bit of that, Bluege, Spence, Richards, and Summers all trooped out to the scene of the supposed crime. A workhorse from 1934 through ’37, Bridges would never make 30 starts or pitch 200 innings in a season after that. He could still pitch, though, and feasted on the American League’s war-depleted ranks in 1942 and ’43, posting the lowest ERAs of his entire career. 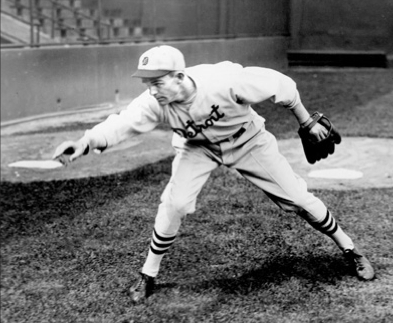 In both seasons (and also in 1941) he made exactly 22 starts, essentially starting once per week. While Bridges might not have been durable enough to take his turn in the rotation every four or five days, he was healthy enough for Uncle Sam. In November of 1943, Bridges was inducted into the US Army and reported for duty at Fort Sheridan, Illinois. “I’m ready to go wherever the Army thinks I can be most useful,” he said. That turned out to be Camp Crowder, Missouri, where Bridges did a lot of pitching. He was discharged in late August 1945, and just a few days later started for the Tigers against the White Sox. He got the victory but didn’t pitch all that well, and pitched only three more times, all in relief, the rest of the season. He also pitched a couple of innings in the World Series, with the Tigers topping the Cubs in seven games. He didn’t. He won just once all season, in the second game of an early-May doubleheader, and he lost once (at Fenway Park just three days earlier, when Ted Williams homered in the bottom of the tenth inning). On September 16, having worked in only nine games all season, Bridges drew his release. “ ‘Well,’ he says, ‘I’ll tell you what happened. The Yankees want to bring him back for the stretch drive, for the last month or so. Tommy’s been thinking about it, and I’m going to hold him out one more day and he’s going to give me his decision.’ And Tommy decided not to go. “When I’d drive down to council meetings, I’d go down First Street. That was a one-way street. There was a sporting goods shop. One day, as I was crossing Michigan Avenue, I noticed this guy lying by this store. I drove about two stores down and I thought, ‘Goddamn, that looked like Bridges.’ So I backed the car up and got out and sure enough, it’s Tommy Bridges. Jesus Christ, he looked horrible. Auker tried to help Bridges, too. When Bridges knocked on Auker’s door one evening and asked for $125 to buy some new clothes and “get straightened away” for a job interview, Auker gave it to him, with the stipulation that if Bridges could go for six months without a drink, the loan would be forgiven. The next morning, Bridges was found on his front lawn, passed out. He’d cashed Auker’s check at a local tavern, and drank the money away. It’s not clear when these incidents occurred. Probably in the 1950s. From 1958 through ’60, Bridges worked for the Tigers as a scout and minor-league pitching coach, and he scouted for the Mets from 1963 until his death. During offseasons, he reportedly sold tires in Detroit and Lakeland, Florida. In 1967 Bridges was diagnosed with liver cancer. He and his second wife moved from Lakeland to Nashville, and he died there in April 1968. This article is a revised version of an article originally published in The Neyer/James Guide to Pitchers (Fireside, 2004). For sources, I relied on a large number of newspaper clippings from Bridges’ file at the National Baseball Hall of Fame Library. Other key sources include Richard Bak’s Cobb Would Have Caught It (Detroit: Wayne State University Press, 1993), Elden Auker’s Sleeper Cars and Flannel Uniforms (Chicago: Triumph Books, 2001), Portland newspapers in 1947, and the periodical Pacific Coast League Baseball News from the late 1940s. Ken Beck’s 2011 article in the Wilson (Tennessee) Post was the primary source of information about Bridges’ family and his life after leaving the major leagues.